COLLINS – (AP) The U.S. Department of Agriculture has revoked the exhibitor license from the Collins Zoo. Over the years the USDA has cited zoo owners Gus and Betty White for a wide range of violations to include failing to safely handle animals, failure to provide adequate veterinarian care and cages holding dangerous animals lacking structural integrity. 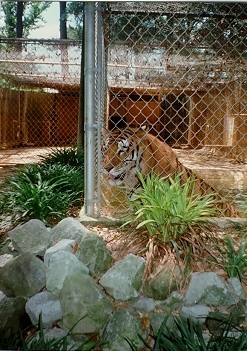 In January of 2012 the Mississippi Department of Wildlife, Fisheries and Parks seized tigers, cougars, leopards, a monkey, and some wolves from the zoo. An administrative judge at the USDA issued an order made public this month that said conditions at the zoo put the animals in jeopardy. The USDA said they moved for license revocation after a large number of animals died at the facility on Highway 49, including at least one tiger, a lion, a leopard, a cougar, a wolf and a dingo in a two year period from 2010-2012. The Humane Society of the United States said in a news release that the zoo can stay open until June 1. White said she will appeal the decision. In September, Covington County Justice Court Judge Bobby Wayne Mooney asked the MDWFP to generate a comprehensive list of state regulation violations at the zoo for the Whites, and would give them time to come into compliance. Mooney said he would rule whether animals seized in the 2012 raid could be returned to the zoo. White said she has complied with the list, but has yet to hear from MDWFP. “I’ve got the cages empty and waiting on my animals,” she said. The justice court hearing came after a circuit court review, remanding the case back to justice court for revision. Circuit Judge William Barnett signed an order ruling the MDWFP violated the Whites’ due process rights following the seizure. The order also says the MDWFP rules regarding the seizure of inherently dangerous animals requires three days’ notice before officials obtain an order of seizure from justice court, and that the department rules were violated because officials gave the three days’ notice after the seizure order already was entered, thus denying the Whites a hearing. According to their website, the zoo opened more than 20 years ago and began as a rescue facility for exotic animals. The zoo claims to have the state’s largest exhibit of big cats and they are funded entirely be private donations and admission fees.